When the dreaded allergy season rolls around, you may feel as though nothing can help stop your allergies. But here are some helpful tips on how to deal with allergies. Do you feel helpless when allergy season approaches? Don’t worry, you’re not alone. Over 50 million people suffer from allergies every year. Whether your trigger is a certain type of mold or pollen, the side-effects can be infuriating. They can also lead to other chronic illnesses. 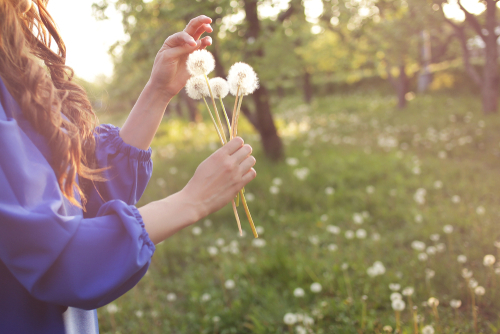 Fortunately, there are a number of things you can do to make allergy season more tolerable. It means changing up your routine and taking a few extra precautions. To learn how to deal with allergies this season, keep reading. We’re going over ten easy tips. It’s ironic that allergy season is also usually the best time to open your windows and let the cool breeze in. Unfortunately, you’re also letting in pollen, molds, and other triggers. You’ll need to keep those windows shut. It’s also important to change clothes when you come in from working in the garden. It’s surprising how many allergens can hitch a ride into your home. In addition, if you’re outside for an extended amount of time, take a shower once you get home. This ensures you’re getting rid of invisible allergens. If you’re prone to hay fever during allergy season, you’re well aware of how irritated your eyes get. By simply wearing sunglasses while you’re outside, you cut down on the number of mold spores and pollen that get in your eyes. If you spend a lot of time outside, you may want to invest in a pair of shades that wrap around the sides of your eyes. These provide even more protection. If you’re a contact lens wearer, you may feel inclined to switch to glasses during allergy season. It turns out you can stick with your contacts if you learn more about necessary precautions. Drinking plenty of fluids is important during allergy season. Remaining hydrated will help thin mucus and cut down on congestion. It’s also a good idea to start consuming hot fluids such as tea and soup. The steam can help clear your airways and the heat helps break up mucus. You’ll also want to cut back on alcoholic beverages, as these actually dehydrate you and weaken your immune system. Regardless of the precautions you take to keep allergens out of your home, some are bound to find their way in. Dust mites are particularly pesky and can easily make it into your bedding. The best way to get rid of them is to wash all bedding in hot water once a week. Then, dry on high heat to ensure all dust mites get eliminated. If the family pet likes to sleep on a particular blanket, you’ll need to wash this as well. If you have really bad allergies, you need to protect yourself when you go outside. The best way to do this is by wearing a mask. This is especially important when working in your yard. Mowing and raking will kick up dust, pollen, and other allergens. These masks help filter out particles and keep your airways clear. You can find them at drugstores or in the lawn and garden center at your local home improvement store. Using a nasal rinse on a regular basis will help clear allergens from the membranes in your nasal passage. This helps stop symptoms like congestion and postnasal drip. A nasal rinse kit will come with a saline solution. If you’re using a neti pot, you may opt to make the rinse yourself. You just need to add a tiny pinch of baking soda and a pinch of salt to eight ounces of warm, distilled water. Do this once a day and you’ll notice a huge difference. If your allergy symptoms are relentless, you may need to start taking over-the-counter drugs to help make things tolerable. Antihistamines help with a runny nose and itchy eyes. They can also help you sleep if your symptoms are keeping you up. Decongestants will help with sinus pressure and a stuffy nose. Look for non-drowsy medications if you need them throughout the day. If you’re not reacting well to over-the-counter drugs, ask your doctor about prescribing something stronger. Simply by keeping your home clean, you’ll cut down on allergens and notice a decrease in symptoms. Make sure you dust on a regular basis. Concentrate on curtains, blinds, and the tops of ceiling fans. You should also thoroughly clean areas of bad ventilation, including basements, laundry rooms, and closets. Use bleach in bathrooms and the kitchen. If you prefer to stay away from over-the-counter or prescription drugs, there are a number of natural remedies you can use. Probiotics can help boost your immune system and ward off symptoms of allergies. As far as supplements go, use butterbur and bromelain as natural antihistamines. Many people now use acupuncture to help with their allergies. The pressure points targeted can curb symptoms. If you like to start your day with a jog or walk around the neighborhood, there’s a good chance this is adding to your symptoms. This is because airborne allergens are highest during the morning hours. Instead, try getting your exercise in the early afternoon. If this is a problem, you may want to move your workout to the gym during allergy season. If you shower in the morning, consider switching this to the evening. You’ll rid your body of the allergens that make it into your bed and cause congestion and itchy eyes. Seasonal allergies are frustrating, but if you take little steps to reduce your symptoms, you can enjoy the otherwise beautiful time of year. Find what works for you and incorporate it into your routine. Keep these tips on how to deal with allergies available when the pollen count starts to rise. Check out more articles on home health today.